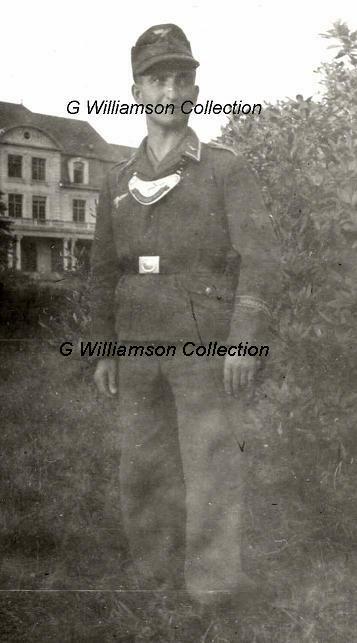 Apart from a few well known photos of Fallschirmj?ger Feldgendarmerie, photos of Luft Feldgendarmen are very rare, and nothing so far has ever references them wearing the Feldgendarmerie sleeve eagle. I do have a few shots of HG Div Feldgendarmes who wear the standard army cuffband, but no sleeve eagle. Well, here is proof that they did wear the sleeve eagle. This guy wears it on the Fliegerbluse complete with army pattern cuffband and Luft pattern Gorget. It is also interesting to speculate what colour his collar patches are ? My initial thoughts too. Yet the correct collar tabs for Fg of the Felddivisionen were green with orange piping and for HG Div white with orange piping or just white. Its difficult to see on this scan but he does appear to be wearing collar tabs which are of a solid colour, no piping. 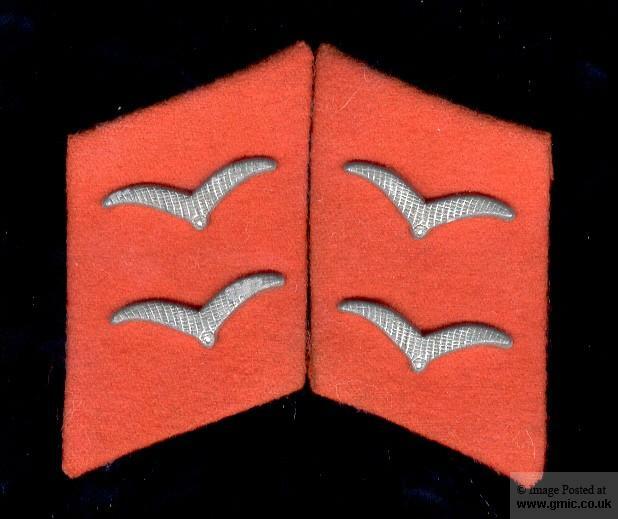 It was not OFFICIALLY possible for the HG unit Feldgendarmerie to have the white tabs with the orange outer piping, as the regulation ordering the replacement of the tabs with the waffenfarbe as an outer piping with the unpiped solid white tabs(Mar43) predates the creation of the LW Feldgendarmerie in Jun43. 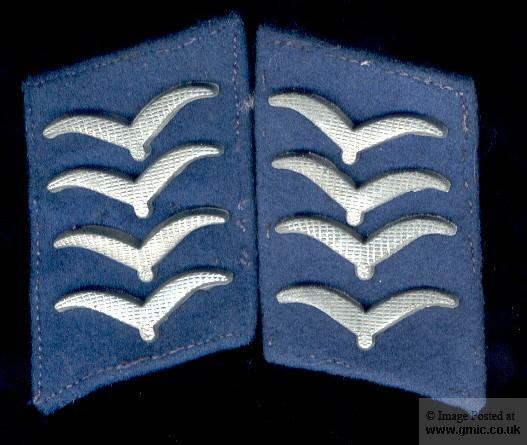 Before Mar 43, all shoulder boards and straps for members of the HG were white, regardless of the member's specialty, as the waffenfarbe was piped around the collar tabs. 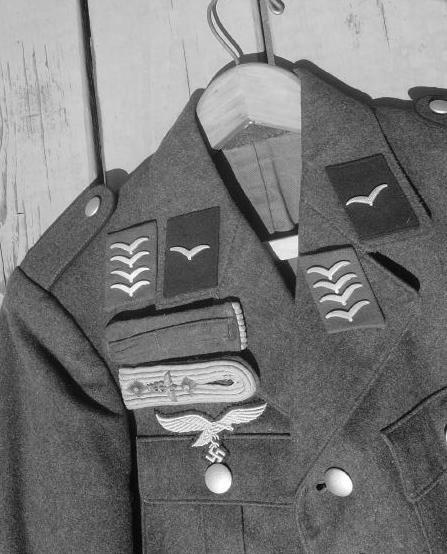 With the removal of the piped collar tabs, the shoulder straps were also changed, to reflect the member's waffenfarbe. In theory, it is possible for there to be green FD tabs with the orange outer piping as I have not found any regulations indicating if/when the use of piped collar tabs was ended. They must have been at some time, because of the existence of unpiped green EM tabs. I just dont know. I have yet to come across any FD tabs with the orange outer piping. It would make sense that the other field or forward units, such as the Fallschirmjagers, would have Feldgendarmerie personnel as well. Perhaps they used the solid orange tabs? Mine are not the first set of orange EM tabs I have seen. I have seen two others over the years. Is this photo yours? If so, can scan it again, blowing up the area of his collar tabs to the max size? 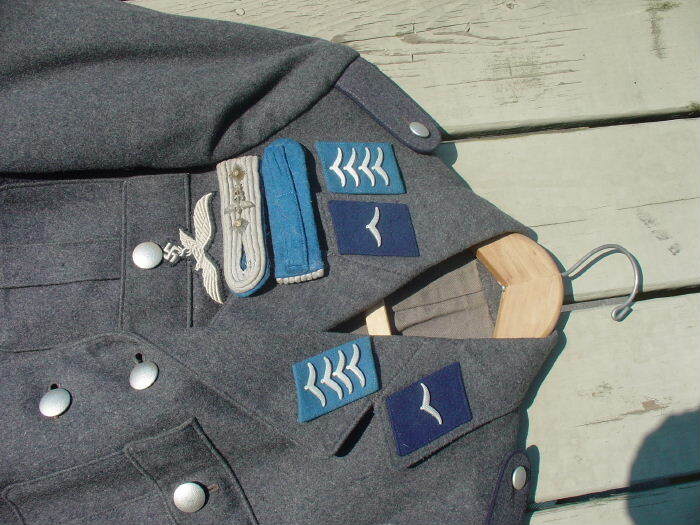 Also, does the shading on the collar tabs seem to match that of the sleeve eagle? From what I can see, it seems to! Yes the original photo is mine. Here is an enlargement. I am sure you can make out the rear edge of the collar tab. Definitely not just wings pinned to the collar. Could be green tabs ? Who knows what color the tabs are... they could be green or orange or...? I wish color photography came along 10 years sooner! lol The tabs seem to match the color on the sleeve eagle. What do you think? Well, the only units which would have Fg are Para ( the tabs definitely aren't yellow ), HG (they certainly aren't white) and Feld Division ( they could be green). The sleeve eagle has to be orange, can't be green for Fg. So, its either green tabs, or orange as per the set you have. My bet would be green. Another possiblity... I had almost forgotten. The Feldgendarmerie shared a light blue waffenfarbe with the Supply troops prior to Jun1943. These tabs are actually a much lighter color in person. The color is powder blue, which matches the TSD Admin tabs. I dont think that they are DLV as the color is a bit brighter. Better look at them. Also, they are compared with Medical and TSD insignia. Paul, I think you've hit the nail on the head. Look at your pic in black & white. very difficult to make out these light blue tabs against a field blue backing. Just like the Fg photo. That is great stuff! Like the orange tabs, this waffenfarbe is listed only as an outer piping for FD and HG units. The solid color is not documented in the current reference material! I would also tend to think that the green used by the FD would show up as a darker color, like the medical tabs. The other question is, for me at least, how often was the cuffband seen in Luftwaffe use? One source I have seen cites that the brown cuffband was used in the HG division but only by former police officers. Anyone able to add to this? Interesting Point Tim. I hope that someone has the answer to this one. I'm going to jump on board with this discussion; I'm in the process of putting together a Luftwaffe Field Division Feldgendarmerie impression for living histories/reenactments and I've hit a roadblock that has been discussed here already. My biggest question I've been trying to figure out is what color collar insignia and shoulder boards should I use? 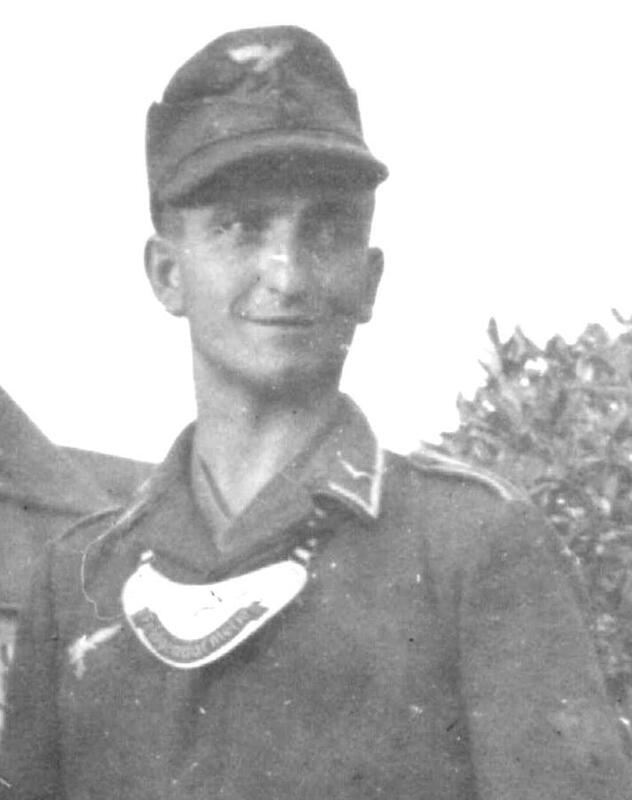 Right now I'm considering the green field division collar insignia with Feldgendarmerie shoulder boards, similar to how the Wehrmacht phased out the orange litzen but maintained the Feld. shoulder boards, any input? That is the later war version- solid green tabs with orange shoulder board piping.